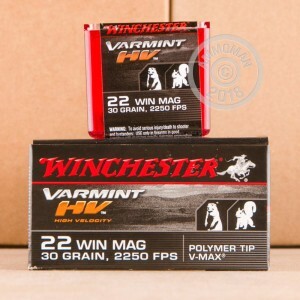 Winchester pioneered the .22 Winchester Magnum Rifle round in 1959 and continues to create some of the best ammo in this caliber to this day. 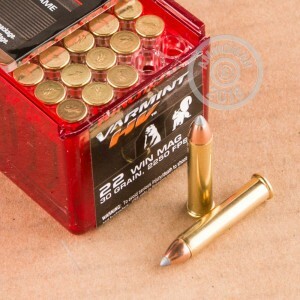 This pack of 50 rimfire rounds will help you clean up the ranch and keep varmints at bay. Winchester keeps their classic design up to date with Hornady's V-MAX bullet; a round with a hollow cavity, for expansion/fragmentation, filled by a hollow-tip for in-flight stability and precision. The 30 grain weight allows for the high muzzle velocity of 2,250 feet per second while also providing enough momentum to take larger varmints like foxes and coyotes. 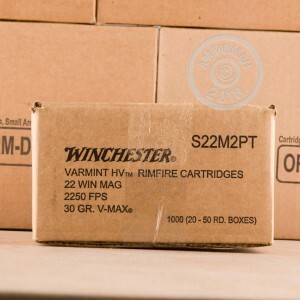 It is recommended that these rounds be fired with a .22 WMR rifle in order to achieve that muzzle velocity terminal effect.